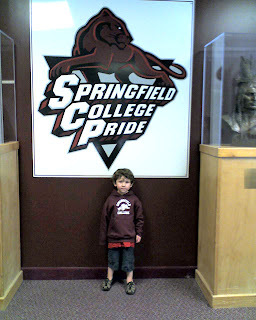 I got to spend the day Friday at my alma mater Springfield College. I graduated from there, as did my two nieces and a great-uncle. 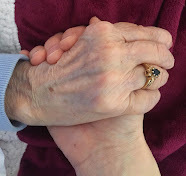 My parents attended Learning in Later Life at Springfield College. And my sister and one of my nieces work there. Peanutman, my great-nephew, goes to the day care affiliated with the college. However, it happened to be closed on Friday so his favorite auntie (me!) spent the morning babysitting while his Mom was working. 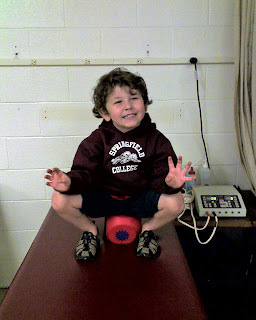 We hung out in the athletic training room while Grammie (my sister) got a compression treatment for a sore foot, ran around the indoor track on the top of the gym (this made Auntie pretty tired), had lunch, and walked around the campus. 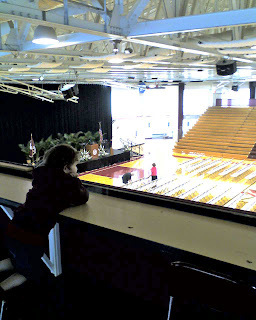 It was the start of new student orientation that day. I remember doing that 26 years ago in 1982 when I was a freshman. Wow. No wonder I could only do one lap around the track. eh hem, make that Great Auntie CJ. peanutman has a long life of charming the ladies ahead of him. what a cutie! The birthplace of basketball. I'm familiar with the Blizzard Art Gallery on campus. Hey, I just noticed one of your favorite movies is Bound. Me-thinks you updated your profile page when you uploaded your new pic. Yes, I would say great too Blondie. Hey Chewy. I didn't change my profile until after I read your comment. I had Bound up there already but added a few more. So you have been to the Blizzard Art Gallery? Shrinky, that is too funny. I wonder if that second cousin thing could work for me? Are You Going To Eat That Roll?